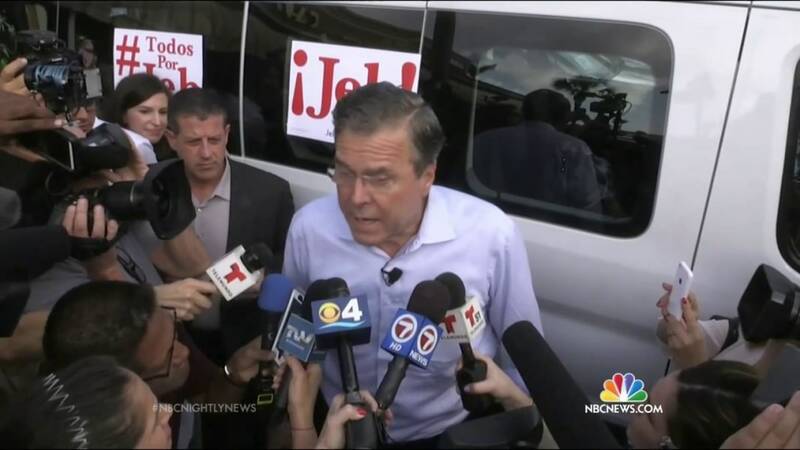 LEXINGTON, South Carolina — Jeb Bush's struggling campaign will cancel planned advertising buys in Iowa and South Carolina, and shift staff from its Miami headquarters in an effort to ramp up its ground game ahead of the first primary votes being cast. "Given the fluid race and the spending decisions by outside groups, we are making strategic adjustments with our resources to ensure we are in the most competitive position possible," campaign spokesperson Allie Brandenburger said in a statement. The campaign says its decision is based in part on the fact that Right to Rise, the super PAC backing Bush's presidential bid, has spent $40 million dollars on advertising so far. That figure dwarfs the mere $1 million spent by the campaign on its advertising efforts. "We have a super PAC that is advertising on TV at a rate that is comparable to any other campaign, if not more, and we're reallocating our resources to voter contact and a ground game that will be second to none — it already is, and we’re effectively doubling that in terms of people who are in the four early states," Bush told reporters Wednesday night. But it also signals a potentially serious financial problem with hard dollars — the money raised directly into the campaign's account. Those dollars, many Republicans agree, have been far more valuable than super PAC cash so far this election cycle because they're more flexible and because candidates have direct influence over how they're spent. Bush's early ad buys were initially aimed at maximizing the advantage a campaign has over a super PAC: they get much lower rates and have to spend far less to get the same amount of time on TV. But Bush's initial overwhelming financial advantage has been all but erased as Donald Trump has soared in polls, and as many donors have lost confidence in the former Florida governor's political skills and campaign team. Spokesman Tim Miller refused to comment when asked about how much money the Bush campaign raised in the final quarter of the year, but GOP sources privately said the campaign's fundraising had dropped off precipitously. Even the Right to Rise super PAC that's funding most ads backing Bush is burning through cash and has struggled to raise money after bringing in more than $100 million in the first half of the year. Bush's focus on the ground staff, however, could be a potentially surprising factor in the early states. His staff in New Hampshire dwarfs that of other candidates, and he also has significant paid staff in Iowa and South Carolina — beyond those of rival Marco Rubio. Still, the withdrawal of the ads means that Rubio and his allies are airing more ads in Iowa and South Carolina than Bush and his backers. The moves mean that New Hampshire, where the Bush campaign has intensified its efforts for months, will see a paid staff increase from 20 to 40 people in January with five campaign offices. The staffs in Iowa, South Carolina and Nevada will expand to near 20 people each when the shifts are complete. The Bush campaign said it will remain on the air with television advertising in New Hampshire through that state's primary, but will move some of its reserved time earlier than previously scheduled. Right to Rise debuted two television ads this week, one in Iowa hitting Rubio for missed briefings on Capitol Hill, and another in New Hampshire contrasting Bush's record with other governors in the race. Bush has spoken frequently about his faith in advertising, and will often mention seeing his own television ads while in New Hampshire. However, the ads have so far had marginal impact as Bush continues to languish in the polls. The reallocation of resources one month before the Iowa caucuses raises questions about whether Bush will remain committed to competing in key early voting states. The spending between the super PAC and the Bush campaign on television advertising remains the most money spent on advertising in support of any candidate in the 2016 race. Bush will hold a campaign event Wednesday night in South Carolina. A town hall in New Hampshire Tuesday was canceled due to weather.